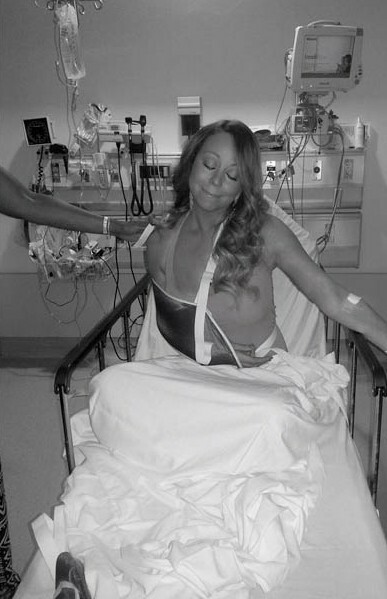 Mariah Carey tweeted this hospital photo to garner some sympathy from fans after she dislocated her shoulder while filming a video. What she DOESN’T want you to know is exactly what happened. She wasn’t doing some sort of stunt or complicated dance step – she simply fell off her ridiculously high heels! When she’s in public wearing her platform stilettos Mariah always has a man on either side of her to keep her from falling. In the video she actually had to stand alone without help – she lost her balance and succumbed to the height of her heels and took a nasty fall. Embarrassing and painful.